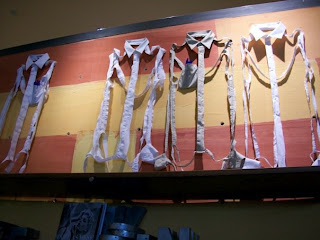 When I walked into the Anthropologie store at the Americana in Glendale, this piece of exhibit completely drew me in. As I passed all the racks of hot items for fall and the table of new accessories, I couldn’t help but wonder where I’ve seen such similar art before. This unique, irregular yet potent display in such a retail environment startled a powerful message that I, too, may not be able to conceptualize. Then it hit me. DMF’s art website: mixedmediartist.com. If you don’t already know, Dawn Marie Forsyth is the Chairperson of Fashion Design at FIDM. I remember crossing through Ms. Forsyth’s website some months ago, but her overriding and racy images stayed with me. DMF’s personal composition takes the audience into a whole new level of standard juxtaposition. For a topic that rarely discloses perceptibly, this artist dissects and presents her message through the deconstruction and comparison of material things. In her words, “These processes of deconstruction and reconstruction allow me to create tactile environments that expose limitations, our own and those put upon us by others through social constructs.” Her interpretation for feminism and social freedom points the validity of how we can discover new meanings and lessons from reconstructing and revitalizing old constructed ideas. Looking closely at the way tangible pieces display such complication symbolizes the restraints of real life’s struggle. Perhaps it would take relentless research, patience, and creativity to understand this unconventional way of accepting the existence of human limitations, but Ms. Dawn Marie’s work of art, in all its metaphoric complexity, is not at all short of inspiring.